Fresno Pacific’s Spencer Heimerdinger has been named the PacWest Freshman of the Week dating Dec. 9-15. 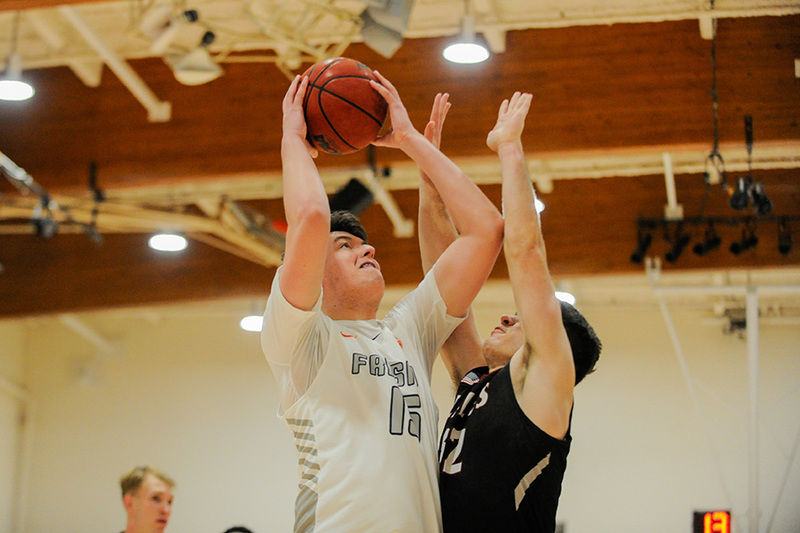 Heimerdinger, a 6-foot-9, 270 pound Buchanan High School grad, led FPU to a 89-59 dominant win over West Coast Baptist last week. The big man had a superb all-around game and totaled 15 points (6-10 FG), seven rebounds, four blocks and three assists for the ‘Birds. He then added two points, a block and a rebound in a 62-71 setback against Concordia. Heimerdinger led the conference in blocks for the week. “We’ve been really blessed to keep our local talent at home,” Fresno Pacific coach C.J. Haydock said. “Spencer has jumped right into a role on our team, where his skill level, intelligence and size allows him to compete right away. While at Buchanan Heimerdinger was a two-time All-TRAC First Team member and is the school’s.all-time leading shot blocker, averaging 22 points, 10 rebounds and 3.5 blocks per game as a senior. He also played volleyball and was named All-TRAC twice, winning three Valley titles in his three years on varsity. It marks the first such award for Heimerdinger and the second for the Sunbirds this season. Nate Kendricks (Immanuel) also earned the award on Dec. 3. Another Clovis Unified grad, Clovis West alum and sophomore Adrian Antunez, starts at guard and is averaging 10 points per game. Fresno Pacific University competes in NCAA Division II and is currently 3-6 on the season. They continue Pac West Conference play at home on December 31 against Chaminade.